Despite the fact that you might not expect to see salad as part of the holiday table (salads are for the new year, right?) the salad recipe I have for you this week will be delicious with the rest of your holiday meal, or any time, really. Thanks to the robust lettuces we are using, it can sit out at room temp without going limp and share a plate with some hot quinoa stuffing and mushroom gravy without wilting too much. The fact that it doesn’t need to be fridge-cold to be enjoyable also means that it won’t make you chilly, an important holiday bonus. It is also a nice raw dish to fill up on that will help you digest the rest of your meal. 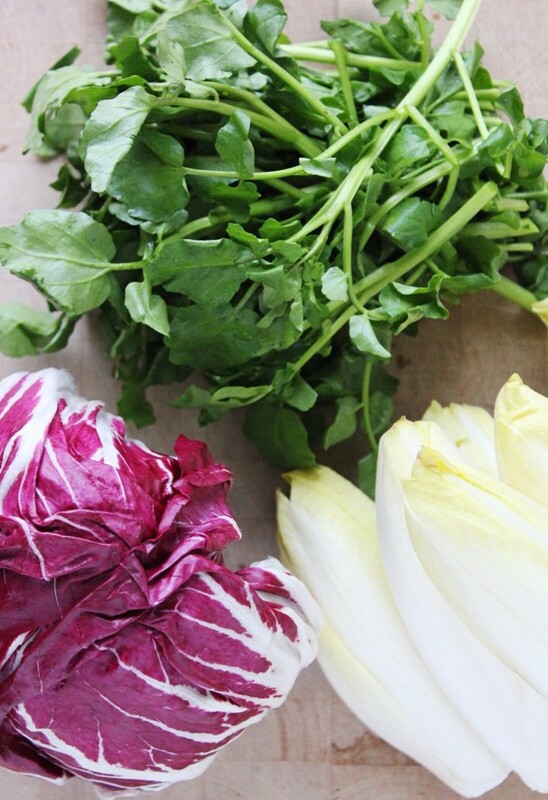 I have chosen some opinionated, bitter and peppery greens (Belgian endive, radicchio and watercress) because they taste interesting and refreshing, and will give your liver some support, something that is so necessary if you have cancer (or have had an indulgent holiday season). Bitter is a taste that we don’t see (taste?) much of these days, but learning to embrace it, especially as an accompaniment to a rich, predominantly cooked meal, is something more than worth getting used to. It is offset by the sweetness of the pomegranate and the richness of the hazelnuts and avocado (avocados are never in season where I live, making them ok December food?). The radishes add to the watery, crisp, and pepper-y theme while adding their beautiful and seasonally appropriate colour. A tart, lemon-y dressing rounds everything out. 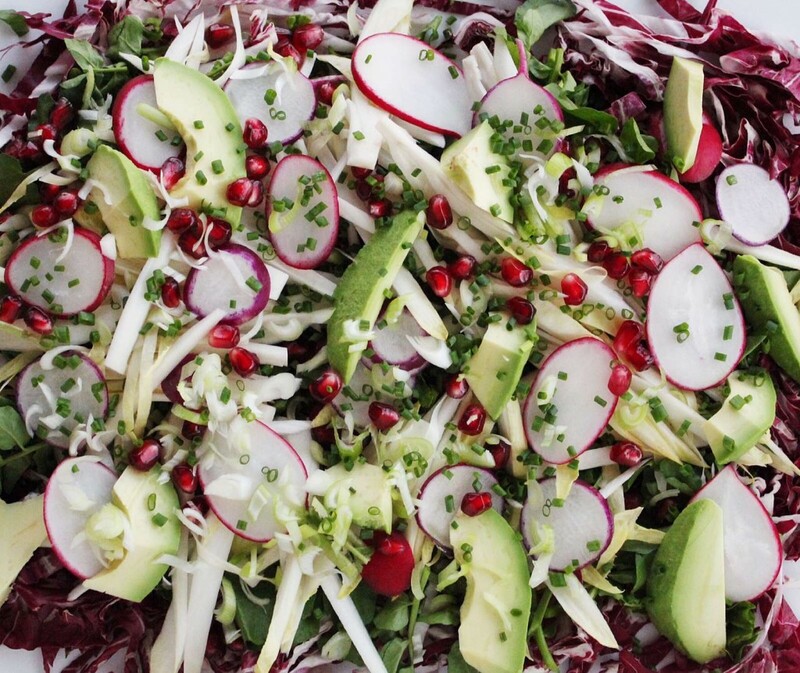 If you are taking this to a party, lay out all of the lettuces on a platter, top with the radishes and green onions and take the pomegranate, whole avocado, hazelnuts and dressing in separate jars. 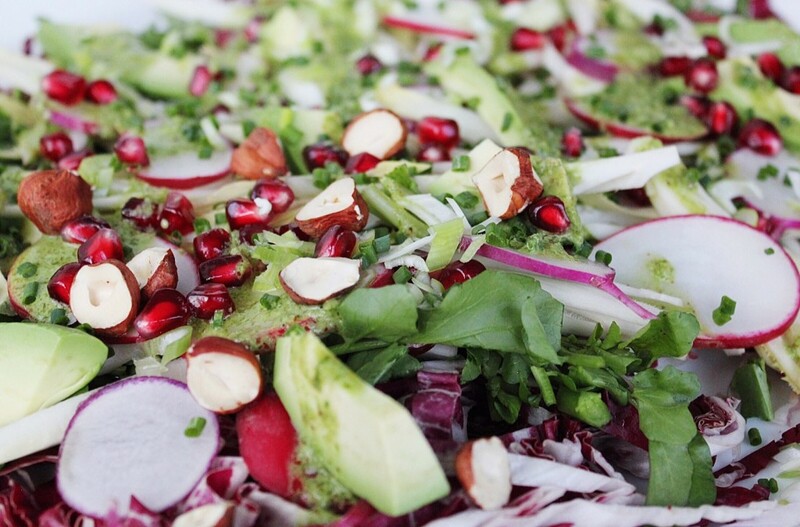 When you arrive, slice up the avocado arrange them on top of the lettuce, drizzle the dressing evenly and lastly, scatter the hazelnuts and pomegranates over the top. 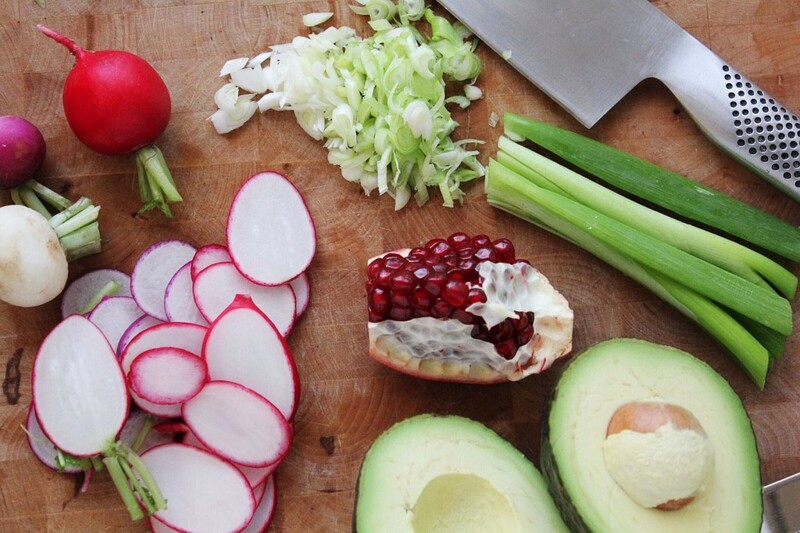 Assemble the veggies in layers if serving on a platter. 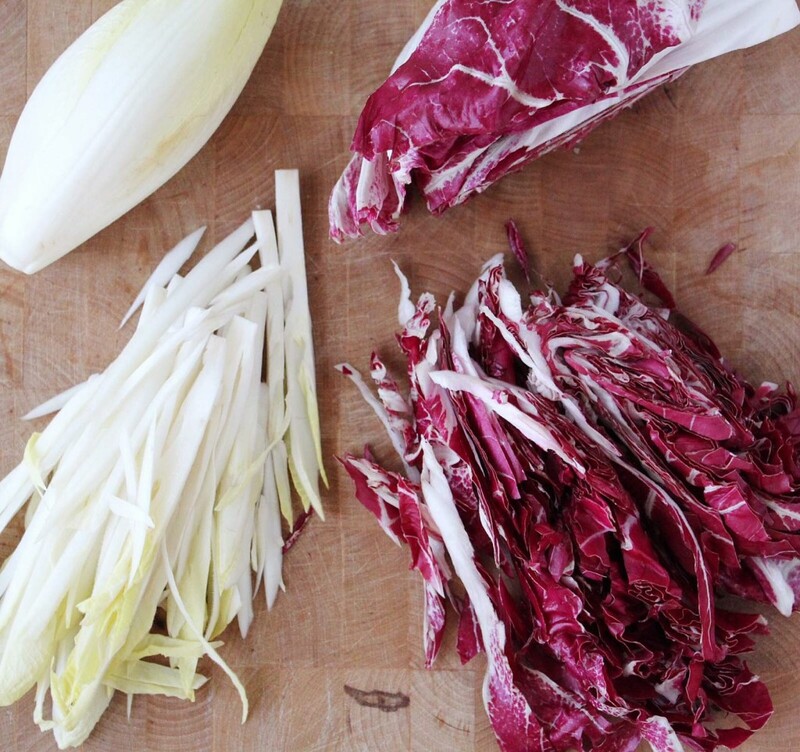 I did radicchio first then watercress, endive, radishes, green onions, avocado, pomegranate, hazelnuts and then chives. If serving as a tossed salad, toss everything together with the dressing, reserving some chives, pomegranate and hazelnuts for garnish on top. 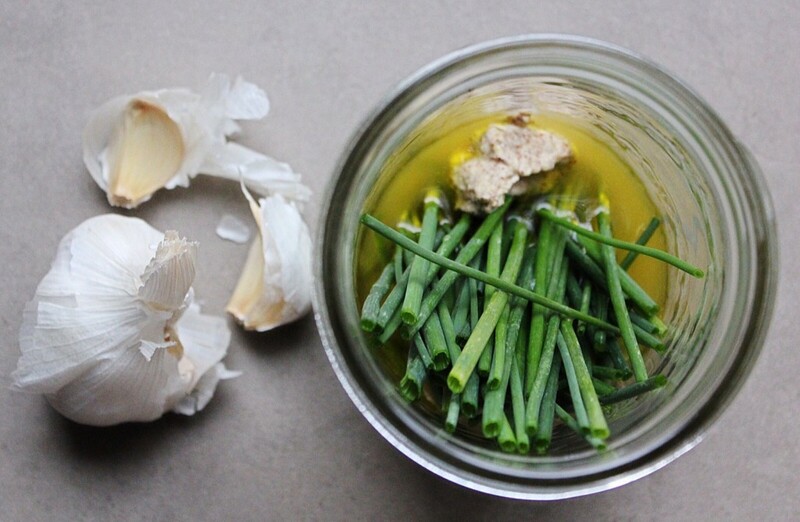 Using a blender or immersion/stick blender, blend all ingredients together until smooth and green. Use immediately or it will turn a less appetizing green (it will still be good, just less pretty).